The night previous we had a great campsite. In Port Townsend we camped at the fairgrounds next to the most consistently loud snorer to date. It was the first night I regretted not bringing ear plugs. We also regretted not allotting more time to hang out in Port Townsend. It seemed a charming place. However on our way out of town we did make time to stop by the Pane d’Amore Bakery. Carrie got a bread pudding muffin and I got a cinnamon roll and for lunch we got a baguette, which had great flavor but the crust was slightly too chewy. I’m a baguette snob now after having eaten possibly 100 baguettes all over France. The best French baguettes had a thick and crispy crust. 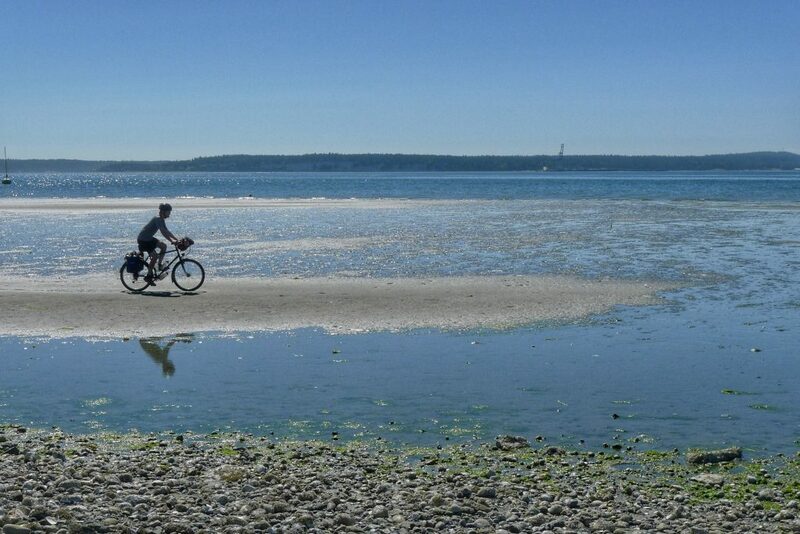 At low tide it was possible to ride on the mud flats south of Port Townsend. No fat bike needed. 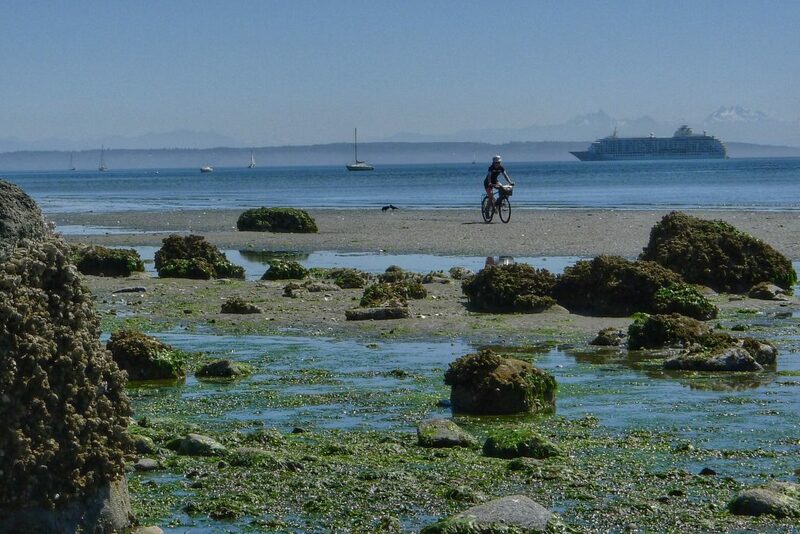 The mud flats were firm enough for some low tide cruising. On the way out of town we hopped on the Larry Scott Trail to avoid traffic. The trail was unpaved but smoother than most roads. It meandered along the coast and then through dense groves of trees, which provided lovely shade. Needless to say we were disappointed when it ended. As we neared Bremerton we encountered for the first time on this trip the suburbs at its worst. All of a sudden we were riding on six lane roads with no shoulders lined by endless strip malls. Traffic whizzed by. Without trees nearby the temperature rose. Nobody could be seen outside their vehicles. We had entered the outskirts of the Seattle commuter sprawl and it was a rude awakening. After riding through rural areas for the past five weeks we’d put all this madness out of our minds. But we were back in the thick of it again. As the last official day of real riding before getting ready to pack up our bikes for the flight home we experienced the full spectrum of highs and lows that cycle tourists encounter. While we were on the Larry Scott Trail we toyed with the idea of continuing down the coast back home only to be reminded during the fight through the suburbs that ending our journey in Seattle would be for the best. Some tours just need to end.